There were wonderful German handicrafts and Christmas merchandise to purchase. I couldn't resist these wooden Christmas decorations. The food and merchandise vendors were each housed in these little cute wooden houses. Each house was ornately decorated and very festive looking. Here is a peek at their roof tops. 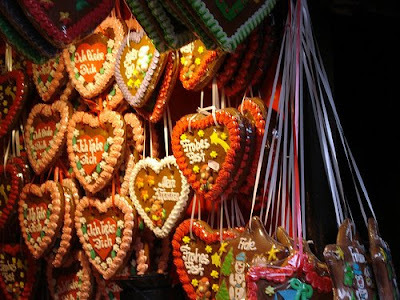 Gingerbread hearts decorated in true Bavarian style. 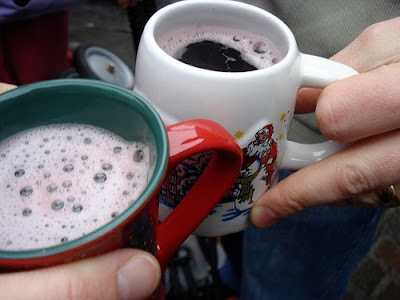 Gluehwein or Glow wine is sold and served in these mugs. It is served warm and was just the thing to take the chill off as we wandered through the market. The mugs can be kept as souvenirs or returned to the vendor in exchange for 4 euros. There were many street musicians as well as performances put on by the Market. We were at the market on St. Nikolas day so naturally he made an appearance there. 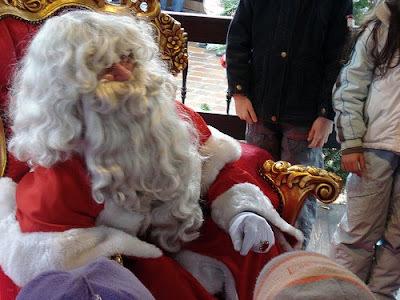 We were lucky to catch him right as he was starting to greet children, so Eva was able to say hello and get a chocolate. This was one of 2 carousels at the market. Eva eagerly hopped on, but Audrey needed a little convincing. 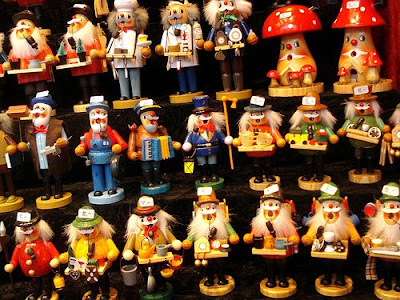 Coincidently I read another blog post today about a Christmas Market in Munich. Lookie here. 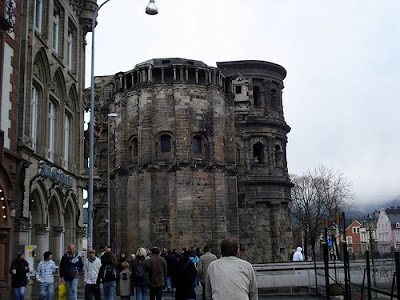 More pictures from our trip here. It’s that time of the year once again when we think about Christmas shoppping. Wow - what a great experience for the girls to spend Christmas in such a facinating place! so fun! 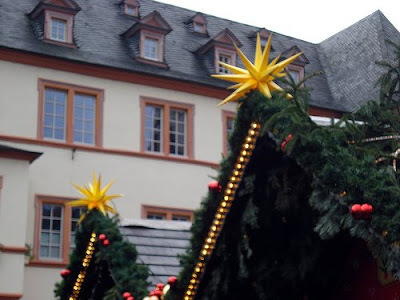 i went to a christmas market in germany on a school field trip when i was about 10, i remember there was a guy that made glass ornaments while you watched. i think i still have them at my mother's house. i hope you bought one of those cute wooden mushroom ornaments! 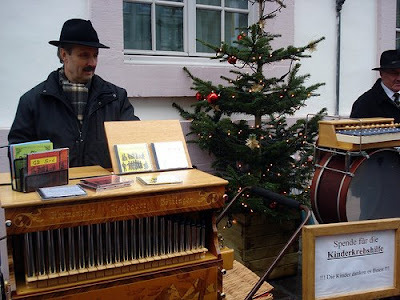 My husband grew up in Austria, and one of his all time favorite memories is of the Chriskindlemarkt. Thanks for posting pictures! Great pics! 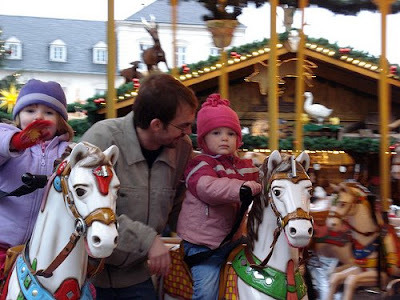 I loved the Trier Christmas Market when we were living in Bitburg. How pretty! 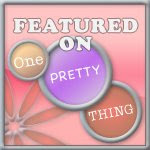 Nothing like that here in Malaysia...Love all your crafty stuff.